This brings us to our final chapter. In this chapter Nevin describes in detail what the system of the Catechism consists of. He describes its theological ground and constitution, its general method and forms of action, and a historical exemplification of its use. Just as the Anxious Bench was the type of a certain religious system, so too the Catechism is a type of a religious system, a system that is in direct opposition to that of the Anxious Bench. The first distinguishing characteristic is the issue of salvation. The Bench is thoroughly Pelagian to the core, while the Catechism consists not of the sinners own power and strength, but consists of the new creation in Christ Jesus by the power of God. 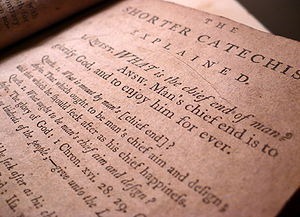 The Bench is all about what man does, the Catechism is all about what God does. This system also includes the wide range of the proper pastoral work, as distinguished from that of the pulpit. 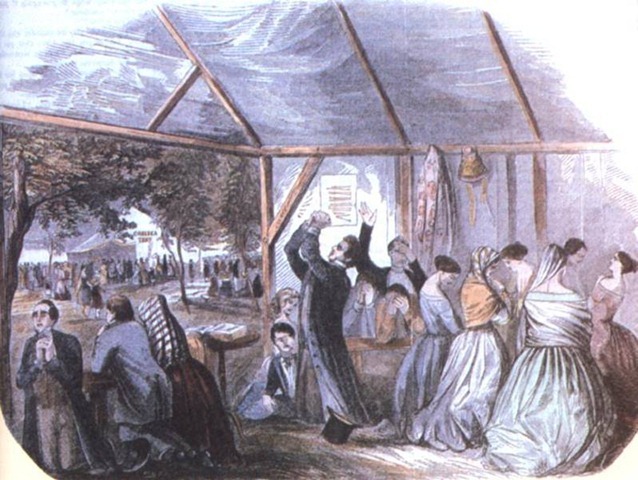 The faithful minister is found preaching the gospel from house to house, as well as in a more public way; visiting the families that are under his care, expressly for this purpose; conversing with old and young, on the great subject of personal religion; mingling with the poor, in their humble dwellings, as well as with those in better circumstances: ministering the instructions of religion, or its consolations, at the bed-side of the sick or dying; and in one word laying himself out in continual labors of love towards all, as the servant of all for Jesus’ sake. The holiness of his own life particularly becomes, in these circumstances, an agency powerful beyond all others, to recomm end and enforce the gospel he is called to preach. To all who know him, his very presence carries with it the weight of an impressive testimony in favor of the truth. The parish of Kidderminster would seem to have been one, precisely of that sort, which those who glorify “New Measures” in our day are accustomed to consider specially in need of being wrought upon in this way. Were one of this school planted down in the midst of such a congregation, rude, ignorant, immoral, and having no sense whatever of the power of godliness as distinguished from its forms, his very first thought would be probably that nothing could be done to purpose, till the whole community should be roused and stimulated into violent action, in some sudden wholesale way. So perhaps he would appoint a protracted meeting, call in the aid of some professional revivalist, bear down with the whole apparatus of his favorite system upon the people, drive excitement to the uttermost; and then when the field should seem to be carried in this style, it might be trumpeted, with due nourish, in some religious paper, that the parish had become morally regenerated. A most summary and convenient method truly of turning a dry barren Kidderminster into a fruitful field, and causing it to put forth blossoms as the rose. But Baxter did not yield to such fanaticism and quackery. “Mere excitement was of little account in his eyes, except as it might spring from the truth; and he had no conception or expectation of any general good to be accomplished by his ministry, except in the way of a patient, constant attendance upon the work itself, in its most minute details, kept up with prayer and faith from one end of the year to the other.” Baxter preached once every Thursday, and on the same day he held prayer meetings in his own home, meeting with one or two families at a time. Besides that the young people held separate prayer meetings. Two days a week, he and another assistant minister would catechize the people, some fourteen families between the two of them. And many other such things characterized Baxter’s ministry. Such was the general method of Baxter’s ministry. It was constant, regular, earnest; not marked with noise and parade; but like the common processes of nature, silent rather, deep, and full of invisible power. He was a man of prayer, and his whole soul was in his work. Thus his ministrations were clothed with uncommon interest and force. Prejudice and opposition gradually gave way. The pastor became the centre of all hearts. In the end, the change was complete. We hear of no sudden general excitement, no pains taken to secure anything of that sort; no revival, in the ordinary acceptation of the term, as denoting an occasional and transient awakening in the history of a church. But the life of religion in the place was constantly progressive, and the power of a quiet revival might be said to reign, at Kidderminster all the time. The result was wonderful. In conclusion, we have seen that Nevin has very poignantly and accurately presented his case against the Anxious Bench. He has demonstrated over and over again that the power which these revivalist ministers so proudly claim to have is nothing more but pure quackery, and is a chief cause of much spiritual delusion, false conversi on, irreverence for God, His Word, His Sacraments, His Church, and His Holy Spirit. He has correctly diagnosed this spiritual disease as heresy, and he has done so, not out of spite for these people who are so caught up in the emotional fanaticism of it, but exactly the opposite, because he loves them, he cares about their souls, and he has too much reverence for God and love for His Church. He has clearly seen that the result of these New Measures will produce a Church that is largely different than what they were once historically, and have we not seen that pan out into our very own day with his own denomination in which he was a part? The only safe “measure” we can use to make sure that the soundness of conversions is more likely, and that a more godly respect for true and deep and pious religion abounds, is by means of the Catechism. 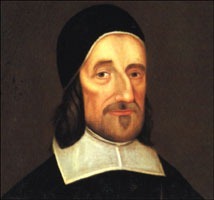 It worked for Richard Baxter, whose congregation was not unlike the congregation of most of the revivalists of Nevin’s day. 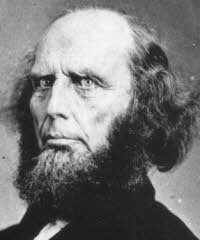 Yet patient godly pastoral teaching, preaching, counseling, catechizing, and visitation proved way more effective than anything Charles Finney and his new measures have ever seen. Nevin offers us keen insight into the psyche of the Anxious Bench, and has clearly shown it to be unstable, and incompetent to offer any true assurance of salvation, and only false and vain hope based upon feelings and not true heart religion brought about by the sovereign grace of God in Christ. It would do us well to listen to Nevin even today, for Finney’s legacy still lives on in American evangelicalism, and one solid way to combat the insanity, is to resurrect the spirit of John Williamson Nevin. May God give us the grace and the wisdom and the strength of heart to do just that. John Williamson Nevin, “The Anxious Bench” edited by Charles Yrigoyon Jr., and George H. Bricker, in Catholic and Reformed: Selected Theological Writings of John Williamson Nevin (Eugene, OR: Pickwick, 1978), 107-108. In this chapter, Nevin argues that the system of the Anxious Bench tends toward disorder; connects itself with a vulgar and irreverent style in religion; women praying in public; unfavorable influence toward deep and earnest piety; and finally he compares the Bench to the system of the Catechism. The first issue is that of disorder. It is argued by the proponents of the Bench that it would be a foolish and ungodly thing to oppose the so-called “disorder” for the sake of “decency”, when in fact it is the power of God Himself that has brought such sinners to a state of wailing, and groaning, and crying, and prostration. Some people also argue that “screaming, shouting, jumping, tumbling, and in one word, the whole wildfire of fanaticism, including the “holy laugh,” and the “holy grin,” might be vindicated in the same way. Only let persons persuade themselves that the “power of God” within them must reveal itself in this style, and all becomes at once rational and right.” Mr. Winebrenner himself said that he approves only of that which is from heaven, and then proceeds to justify all of the preceding things just mentioned as being from heaven. It is then made obviously clear that those things are “from heaven” which of course advance the position of the revivalists. To object to such fanaticism is then to object to the very workings of God. But the truth is, that no satisfactory stopping place can be found in the system of New Measures. Vulgarism is also present in the system of the Anxious Bench. In fact, in order to stir up the people, Nevin insists the vulgarism must prevail. High excitement always tends to destroy men’s reverence for God and sacred things. And so this ‘high pressure’ system, as it is sometimes called, in proportion as it prevails, is always found to work. It gives rise to a style of preaching which is often rude and coarse, as well as uncommonly vapid; and creates an appetite for such false aliment, with a corresponding want of taste for true and solid instruction. All is made to tell upon the one single object of effect. The pulpit is transformed, more or less, into a stage. Divine things are so popularised as to be at last shorn of their dignity as well as their mystery. Anecdotes and stories are plentifully retailed, often in low, familiar, flippant style. Roughness is substituted for strength, and paradox for point. The preacher feels himself and is bent on making himself felt also by the congregation; but God is not felt in the same proportion. In many cases self-will and mere human passion, far more than faith or true zeal for the conversion of souls, preside over the whole occasion. Coarse personalities and harsh denunciations, and changes rung rudely on terms the most sacred and things the most solemn, all betray the wrong spirit that prevails. Nevin believes that the Anxious Bench is an unfavorable influence toward deep and earnest piety. That the experience of the Anxious Bench is commonly shallow is clearly manifest. It is argued that the awakening of these people is indeed the very power of God, and that they are the ones who truly experience the “depths” of experimental piety. Those who oppose these measures have no idea, it is argued, about the true power of the new birth. For if they did, they would not be so offended at the noise that and disorder of poor souls agonizing at the altar. But this is no Biblical argument. For if they had truly met God, and had truly come to a real sense of their own sins, then all the noise at the altar would be simultaneously hushed. For when Job met God, he said that when he met Him, he then abhorred himself and repented in dust and ashes. Therefore it is not the depth of the Anxious Bench and camp meeting conversions, but their utter want of depth that exposes them to complaint. In comparing the system of the Anxious Bench and that of the Catechism, Nevin says this of the Catechetical system. It is a different system altogether that is required, to build up the interests of Christianity in a firm and sure way. A ministry apt to teach; sermons full of unction and light; faithful, systematic instruction ; zeal for the interests of holiness; pastoral visitation; catechetical training; due attention to order and discipline; patient perseverance in the details of the ministerial work; these are the agencies, by which alone the kingdom of God may be expected to go steadily forward, among any people. Where these are fully employed, there will be revivals; but they will be only as it were the natural fruit of the general culture going before, without that spasmodic, meteoric character, which too often distinguishes excitements under this name; while the life of religion will show itself abidingly at work, in the reigning temper of the Church, at all other times…We may style it, for distinction sake, the system of the Catechism. It is another system wholly from that which we have been contemplating in this tract. We find the attempt made in some cases, it is true, to incorporate the power of the Catechism with the use of new measures. But the union is unnatural, and can never be inward and complete. The two systems involve at the bottom, two different theories of religion. The spirit of the Anxious Bench is at war with the spirit of the Catechism. John Williamson Nevin, “The Anxious Bench” edited by Charles Yrigoyon Jr., and George H. Bricker, in Catholic and Reformed: Selected Theological Writings of John Williamson Nevin (Eugene, OR: Pickwick, 1978), 92. In chapter five Nevin demonstrates that the Bench is Vindicated on Insufficient Grounds: as bringing the sinner to a Decision; As involving him in a Committal; As giving force to his Purpose; As a penitential Discipline; As necessary for the purposes of Instruction; As opening the way for Prayer. He goes through this relatively quickly, and thus so shall I. Low and jejune must be the conception of religion, which can allow such a view as this to be entertained. It is well indeed that sinners should bind themselves by an inward resolution, to seek the Lord, while he is to be found; and it is right that they should be urged to do this, on all suitable occasions. But such a resolution, to be of any account, must proceed from intelligent reflection and inward self-possession; and it can have no salutary force, except as entertained in the consciousness of God’s presence and God’s authority, to the exclusion comparatively of all inferior references. Nothing can be more irrational, than to think of making the sinner’s feelings in this case a trap for his judgment, and then holding him fast by the force of an outward bond. The circumstances, in which he is urged to put his soul thus under pledge, are the very worst that could well be imagined for the purpose. In a number of instances those who openly fall back into the world do so without a “feeling of humiliation and spite in the recollection of their own weakness; and their state subsequently is worse than it was before.” But there are those who do make it into the Church, and their profession seems to have a hold on them at least in the forms of external religion. In fact they might continue in such a condition until the day of their death, without any sense as to the falseness of the conversion. The third issue Nevin addresses is the argument that coming to the Anxious Bench gives the person the strength to continue on in the things of religion. The Bench is like the first step towards Christ, just as the signing of a temperance pledge by a drunk is the first step he takes toward sobriety. The most difficult step is the first step, and if we can get the person to take the first step, this is much better than no step at all. In any case however, vows and pledges that spring from excitement rather than reflection, are to be considered fanatical, and as such neither rational nor free; and though in certain cases, men may seem to be strengthened and supported by them, in the prosecution of good ends belonging to a lower sphere, they are ever to be deprecated in the sphere of religion, as tending only to delusion and sin. The fourth issue that Dr. Nevin addresses is the argument that the Bench is well suited to humble the sinner and break his pride. How is a person ever expected to humble themselves and come to the cross, if they can’t even come to the Anxious Bench? If unwilling to stoop to the self-denial involved in coming to this, how can the awakened person be willing to do anything that religion requires. Thus the pride and wickedness of the heart, in relation to the gospel, are forced home upon the individual’s consciousness; and when at length, under the pressure of this conviction, he goes forward and joins himself openly with the anxious, his pride is prostrated, and he is no longer ashamed to appear earnestly concerned for the salvation of his soul. Nevin points out that any test could be submitted for which a persons’ pride might be humbled. A more Biblical example would be to have the person clothe themselves in sackcloth and ashes and parade themselves around the Church begging for the prayers of Christians. But in whatever forms his outward demonstration consists, it is no infallible test of the sinners feeling. In fact, one might come to the Anxious Bench for the purpose of puffing himself in the eyes of the congregation present, so he might feel himself to be more spiritual then those who have not submitted to the Bench. Nevin demonstrates in his fifth point that the Anxious Bench is no suitable place for a sinner to receive instruction concerning matters of religion. It is the customary manner to fill the Bench with sinners, and then to have the minister come to each person individually, one by one, and ask them some questions concerning their spiritual condition. After all have been “instructed”, a general exhortation is given to the group as a whole. Each person is instructed for approximately three to four minutes, since there are a number of people to “instruct”, and the patience of the congregation must be taken into consideration as well. This whole process is called “spiritual instruction”! If a doctor were seen addressing a dozen or so patients in this manner, there would be a great cause for derision. But when the revivalists do it, they are highly esteemed. One of the most difficult and delicate functions a minister is called to perform, is that of giving counsel to awakened sinners. None calls for more caution and discrimination. It is hard to ascertain correctly the state of the spiritual patient, and hard to suit the prescription wisely to his particular wants. It is so, where there may be the fullest opportunity for free, calm investigation, in the family visit, or in a private interview. But here, where all surrounding influences conspire to complicate the difficulty to the greatest extent, in the midst of commotion without and commotion within, it is pretended to dispose of a dozen such cases perhaps in the course of half an hour. Lastly, the sixth point that Nevin addresses is the argument that the unconverted should be called out in order that they might receive prayer. It is through the Anxious Bench that the Church knows for whom to pray. By looking upon such people, the Church will be stirred up in their pity to see such people be saved, which helps to make their prayers more fervent and effectual. It is a suspicious kind of prayer at best that can be engaged, in such circumstances, only by the sight of its objects, theatrically paraded to produce effect, without the power of a more general interest. But it is not necessary that the awakened should be unknown, in the church to which they belong. They may be discovered without the aid of the Anxious Bench, and can be carried so upon the hearts of God’s people, in the sanctuary and in the closet, with an interest far more deep and active, than any that is produced in the other way. John Williamson Nevin, “The Anxious Bench” edited by Charles Yrigoyon Jr., and George H. Bricker, in Catholic and Reformed: Selected Theological Writings of John Williamson Nevin (Eugene, OR: Pickwick, 1978), 77. 1. it creates a false issue for the conscience. The real issue for a sinner is, “Will he repent?” The anxious bench changes the issue to, “Will he perform a physical action?” The sinner is thus disastrously distracted from the real issue. 2. the use of the anxious bench obstructs and diverts the action of truth in the minds of the genuinely awakened. 3. the anxious bench fosters spurious conversions. 4. following on inevitably from these three dangers, harm and loss to the souls of men will surely stem from the use of the anxious bench. will he repent and yield his heart to God or not? This is the true issue to be met and settled; and it is all important that he should be so shut up to this in his thoughts, that he may have no power to escape the force of the challenge which it involves. That spiritual treatment must be considered best in his case, which serves most fully to bring this issue into view and holds him most effectually confronted with it in his conscience, beneath the clear light of the Bible. But when in a revivalist meeting where New Measures abound and the Anxious Bench is employed, the question is then something completely different all together. It is no longer, “will he repent or not?” but, “will he go to the Anxious Bench or not?” When this happens, the true issue that needs to be addressed, the issue that God has been dealing with the man about, is pushed to the side and out of the forefront of the mind, only to be replaced by a different issue, and one that has nothing to do with a person’s salvation. This is in fact one of the greatest dangers of the Anxious Bench. Those who employ the Anxious Bench have a desire to remove all stumbling blocks and hindrances to the cross, and to bring a person to Jesus for salvation. But in doing so, they place the Anxious Bench in the way of the sinner which then prevents the person from coming to Jesus, and yet deceives them from thinking that because they came to the Anxious Bench they came to Jesus, and thus they are now saved. It is certainly a little strange, that the class of persons precisely who claim to be the most strenuous, in insisting upon unconditional, immediate submission to God, scarcely tolerating that a sinner should be urged to pray or read the bible, lest his attention should be diverted from that one point, are as a general thing nevertheless quite ready to interpose this measure in his way to the foot of the cross, as though it included in fact the very thing itself. And yet a pilgrimage to the Anxious Bench, is in its own nature as much collateral to the duty of coming to Christ, as a pilgrimage to Jerusalem. Some think that this is a weak argument, and that it is an easy thing to come to the Anxious Bench. But as anyone knows who has experienced such a thing, it is quite an inward battle that takes place inside of the person. Fearing embarrassment, or shame, or a whole host of other feelings, the sinner becomes so overwhelmed with the sheer thought of going to the Anxious Bench, or to the altar, that he is filled with such emotion, and butterflies in the stomach, and other inward turmoil, that Nevin is absolutely correct when he says that the mind becomes preoccupied with a completely different matter altogether. For this reason it ought not to be used, since it is self refuting, because it places the soul in danger of false assurance and hope, and not in the assurance of the true power of the Spirit of God in regeneration and in the New Birth. The second issue Nevin deals with is really one and the same with the first, yet he provides an illuminating example of how it is that a person is actually hindered from coming to Christ by means of the Anxious Bench. I shall reiterate the text here in full, for the effect of the argument, which is made powerful by the story being told in full. Take a single case, in illustration of the way in which the system may be expected to work. Here is a gentle girl, sixteen or seventeen years of age. She finds herself in the midst of a large congregation, where at the close of the sermon, the minister, encouraged by the general seriousness of the house, invites all who are concerned for the salvation of their souls, to come forward and place themselves on the anxious seat. She has been perhaps a long time under some concern, or it may be that God’s truth has been felt for the first time on this occasion; not with great force perhaps, but so at least as to bring her spirit to a solemn stand in the presence of her Maker. She hears the invitation, but shrinks from the thought of doing what the minister demands. The call however is reiterated, and enforced by the most exciting appeals to the imagination. After a few moments there is a stir; one is going forward to the bench, and then another, and another. She is struck, moved, agitated. A struggle has commenced in her bosom, which she herself is not prepared to understand. May she not be fighting against God, she asks herself, in refusing to go forward with the rest? May it not be in her case, at this moment, now or never? All this is solemnly crowded on her alarmed conscience by the whole character of the occasion, in the way in which it is managed by the minister. Already her soul has passed from the element of conviction into the element of excitement. The “still small voice” of the Spirit is drowned amid the tumult of her own conflicting thoughts. But see, she yields. With a desperate struggle, she has thrown herself forth into the aisle. Trembling and agitated in every nerve, poor victim of quackery, she makes her way, consciously in the eye of that large watching assembly, from one end of the house to the other, and sinks, half fainting with the effort, into a corner of the magic seat. And now, where is she, in spiritual position? Are her tears the measure of her sorrow for sin? Alas, she is farther off from God, than she was before this struggle commenced in her father’s pew. Calm reflection is departed. Her hold upon the inward has been lost. Could any intelligent Christian parent truly anxious for the salvation of his daughter, deliberately advise her in the circumstances which have been supposed, to seek religion in this way? Can the pastor be wise, who is willing to subject the: lambs of his flock to such a process, with the view of bringing the good seed of the word, to take root, and vegetate in their hearts? The third issue which Nevin attacks is the idea that coming to the Anxious Bench is equivalent to making a true and real decision to follow Christ. Some have even made it sound like the very act of coming to the Bench is equivalent to coming to Christ Himself. In fact, this is the logical end of the Bench, and its’ very purpose. Indeed I do not see well, how the measure could be employed in any case with much effect, without the help of some such representation. We find accordingly that the whole process, as it were in spite of itself, runs ordinarily into this form. Sinners are exhorted to come to the anxious bench, as for their life, by the same considerations precisely that should have force to bring them to Christ, and that could have no force at all in this case, if it were not confounded more or less to their perception with the other idea. The opposite idea is also communicated to those that refuse to come to the Anxious Bench, namely, that by refusing to do so, a person is rejecting and spurning the person of Christ Himself. After coming to the Bench, the person is then exhorted and encouraged to “continue on” in the life of faith, as if they actually have begun a divine life, and have been regenerated, simply because they sat on a seat. Just as the Baptismal font is the laver of regeneration in the Romish Church, so too, the Anxious Bench has become the laver of regeneration, the gate of paradise, the womb of the New Jerusalem for the Finneyites. The whole measure is so ordered to promote the delusion that the use of the Anxious Bench serves some purpose in the regeneration of the soul. Subsequently then, the fourth point that Nevin deals with in this chapter, is the inevitable result of the first three – harm and loss to the souls of men flow largely from use of the Anxious Bench. Some men will have no desire to be saved, have no inward conviction of sin, and yet, these same ones might very well be envious of attention, or do not want to be left behind as their family and friends go to the Bench, and thus be looked upon as different, or a number of other impure motives might take place in the hearts of men, when called upon to come to the Bench. The person then, whatever their motive, will almost undeniably feel faith, because feelings and emotionalism and excitement rules the hour. Is it a strange thing to imagine that a person, who has no real interest in religion, would get caught up in an emotional frenzy, with the breaking point being that of the Anxious Bench. How natural that this relaxation, carrying with it the sense of relief as compared with the tension that had place before, should be mistaken on such an occasion for the peace of religion, that mysterious something which it is the object of all this process to fetch into the mind. And how natural that the wearied subject of such experience, should be hurried into a wild fit of joy by this imagination, and stand prepared, if need be, to clap his hands and shout hallelujah, over his fancied deliverance. John Williamson Nevin, “The Anxious Bench” edited by Charles Yrigoyon Jr., and George H. Bricker, in Catholic and Reformed: Selected Theological Writings of John Williamson Nevin (Eugene, OR: Pickwick, 1978), 59. …quack lawyers, quack statesmen, quack scholars, quack teachers, quack gentleman, quacks in a word of every name and shape, meet us plentifully in every direction. We need not be surprised, then, to find the evil fully at home also in the sphere of religion. Indeed it might seem to be more at home here, than anywhere else. Here especially the heart of man, “deceitful above all things and desperately wicked,” has shown itself most ingenious in all ages, in substituting the shadow for the reality, the form for the substance, the outward for the inward. The religion of the world has always been, for the most part, arrant quackery. Paganism can exist under no other form. Nevin continues with examples of quackery in the Church, discussing the “mummery of Rome”, as well as the quackery of Simon Magus who had no spiritual strength of himself and thus sought to purchase the Holy Spirit of God from St. Peter. “He was a quack; the prototype and prince of evangelical quacks.” Gnosticism is also quackery, and soon after the Reformation, it did not take long for the Protestants to turn to quackery. All form. No power. 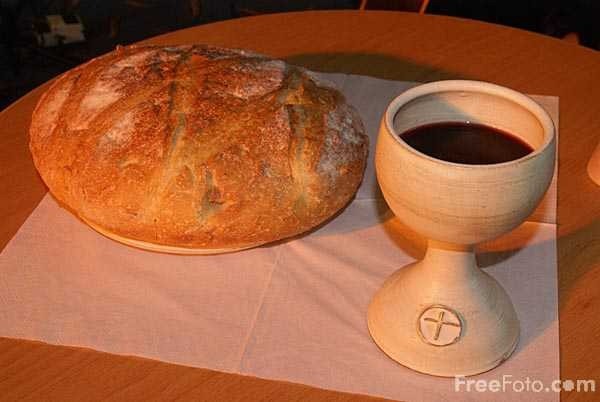 Let the power of religion be present in the soul of him who is called to serve at the altar, and no strange fire will be needed to kindle the sacrifice. He will require no new measures. His strength will appear rather in resuscitating, and clothing with their ancient force, the institutions and services already established for his use. The freshness of a divine life, always young and always new, will stand forth to view in forms that before seemed sapless and dead. Attention will be engaged; interest excited; souls drawn to the sanctuary. Sinners will be awakened, and born into the family of God. Christians will be builded up in faith, and made meet for the inheritance of the saints in light. Religion will grow and prosper. This is the true idea of evangelical power. But the New Measures minister has to resort to quackery. He has no other choice, nor does he know any other way. He is not able to preach well, he spurns the notion of the Catechism, he does not visit his parishioners, nor visit the sick and elderly. He has no time nor desire to be about the business of Pastoral work. He has greater things to attend to than meeting with people. The man who appeared to be all on fire for the salvation of souls, and ready to storm even the common proprieties of life for the sake of the gospel, shows himself now marvelously apathetic towards the whole interest. He has no heart to seize common opportunities, in the house or by the way, to say a word in favor of religion. It is well indeed if he be not found relaxing altogether his ministerial activity, both in the pulpit and from house to house. The truth is, he has no capacity, no inward sufficiency, for the ordinary processes of evangelical labor. And yet, because the revivalist is known to gather a crowd, and many people have been known to come to the Anxious Bench and many have professed faith in Christ, and because there is great enthusiasm and emotion flowing freely throughout the whole congregation assembled, wherever the man may go, he is seen as being, and understood to be, a great man of God, whom the Holy Spirit has chosen to take residence in and anoint for the great task of soul winning. Unfortunately, this so-called minister probably knows very little about the Bible, about holiness, about the Pastoral Ministry, about the Catechism. Thus the result will most likely end up being, the blind leading the blind. Both will fall into a ditch, and the minister who is supposed to be the great power of God, has actually this whole time practically deceived every person into believing they were saved, simply because they got emotional. Which brings us to our next point, false assurance derived from the Anxious Bench. 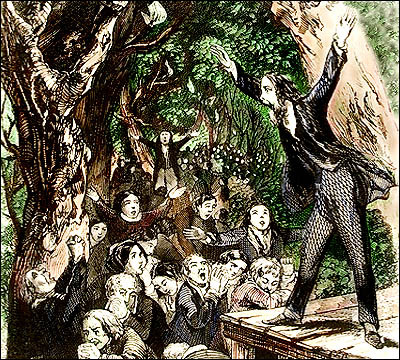 Nick Needham, “Charles Finney and His Critics”; Available from http://www.banneroftruth.org/pages/articles/ article_detail.php?1071; Internet; Accessed 22 November 2009. John Williamson Nevin, “The Anxious Bench” edited by Charles Yrigoyon Jr., and George H. Bricker, in Catholic and Reformed: Selected Theological Writings of John Williamson Nevin (Eugene, OR: Pickwick, 1978), 46. In chapter two of The Anxious Bench, Nevin presents a negative argument against some of the arguments used to advocate the use of the Anxious Bench. The arguments that are used to justify the use of the Bench are: its popularity; its seeming success; certain circumstances in which it is found to prevail; and that no spiritual force is required to give it effect. Let us hear what Nevin has to say concerning these issues. Nevin then considers the question of whether or not the popularity of the Bench is even a reality at all. On hearing of numerous Congregational and Presbyterian Churches in New England and New York which once adopted the Bench, but then soon abandoned it for “a more excellent way”, he holds that “no great account is to be made of its present credit in any way.” Simply put, the argument is: The Anxious Bench ought to be used because everybody’s doing it. Nevin’s response: No they’re NOT.” Simple. Effective. True. It does not follow logically for Nevin, that a thing be considered right and good and ought to be used regularly simply because God might have worked through it. The Bench might still need to be opposed and banished from the Church despite the fact that God used it. Why? Because, as Nevin inferred just previously, God worked in spite of such obstacles. Yes, the Holy Spirit had chosen to use it to save a person, but that does not at all mean that the Spirit has chosen this measure to save all men. The gospel is the means that the Spirit uses to save men, not emotionalism and manipulation. In fact, it is exactly the amount of men that God actually saves through the means of the Bench that concerns Nevin. It is sometimes said indeed, that if only some souls are saved by the use of new measures, we ought thankfully to own their power, and give them our countenance; since even one soul is worth more than a world. But it should be remembered, that the salvation of a sinner may notwithstanding cost too much! If truth and righteousness are made to suffer for the purpose, more is lost than won by the result. We must not do wrong, even to gain a soul for heaven. And if for one thus gained, ten should be virtually destroyed, by the very process employed to reach the point, who will say that such a method of promoting Christianity would deserve to be approved? If Nevin were alive today, perhaps he would have said that these men, by their logic, would make great congressman, since they would advocate borrowing ourselves out of debt. The circumstances in which the Anxious Bench seems to prevail are places in which the majority of the people are often given over to feelings more than over to rational judgment. These people are swayed by impulse more than reflection. A large proportion of the people who come forward to the Anxious Bench are females and young people. In countering Nevin, one person said, “Low and jejune indeed must be the conception of a religion, which can allow a divine to attempt to destroy a “measure,” through which ‘females, girls and boys,’ run to, as a means to enable them to flee the wrath to come.” But this is exactly Nevin’s point. The Anxious Bench and the New Measures are no sure way of assuring a person of their salvation, or of actually brining about a real conversion. If these revivalists were so concerned about the souls of women, and girls and boys, than their target audience would not be those who are ignorant concerning the essence of true religion, and who are easily given over to emotional manipulation. This brings Nevin to his next point, which is, that no spiritual power is necessary to bring a person to the Anxious Bench. All that is needed is the ability to get the people into an emotional frenzy, and then bring them through the Anxious Bench. It shows no inward power whatever, to be able to move a congregation in this way. It can be done without eloquence, and calls for no particular “earnestness or depth of thought. It is truly wonderful indeed, with how little qualification of intellect and soul a man may be fitted to carry all before him at certain times, and to show himself off to the eyes of a bewitched multitude as “the great power of God,” by having recourse to new measures. He may be vulgar, coarse and dull, and so pointless and sapless in his ordinary pulpit services, that it will be a weariness to hear him; and yet you shall find him, from time to time, throwing a whole community into excitement, gathering around him crowded houses night after night, and exercising as it might seem, for the space of three or four weeks, an irresistible sway, in favor of religion. Such cases are by no means uncommon. Some of the most successful practitioners in the art of the Anxious Bench show themselves lamentably defective in the power of serious godliness, as well as in mental cultivation generally. Nevin criticizes these revivalists for being all external, and having no internal fortitude in their work of “religion.” To have the appearance of godliness but to lack the strength thereof, is the nature of quackery. Quackery, is by far Nevin’s favorite characteristic of these Anxious Bench advocates, and he will go into detail in chapter three concerning the details of what exactly quackery consists of. John Williamson Nevin, “The Anxious Bench” edited by Charles Yrigoyon Jr., and George H. Bricker, in Catholic and Reformed: Selected Theological Writings of John Williamson Nevin (Eugene, OR: Pickwick, 1978), 33.
pe the system can well take” is worthy of our confidence in helping to establish a “deep, thorough, and intelligent piety.”  If the Anxious Bench is found to be unworthy of our confidence to help establish true heart regeneration, then the whole system will be stripped of its title to give confidence of that thing which it so claims. And if the Anxious Bench cannot do what it claims, then the whole situation is only something worse than what we originally thought, and therefore needs to be addressed. If it should be found after all, to be not the wisdom and power of God unto salvation, but the fruitful source of error and confusion in religion, an occasion of reproach to the gospel and of ruin to the souls of men, it would be a heavy account surely, to answer for any part taken in its favor. Nevin points out those who have adopted the New Measures have also adopted a very sacred understanding of Revivals, to the effect that to question anything that be used in the cause of revival, despite how irregular it is, is untouchable and not to be subject to scrutiny. “No room must be allowed to criticism where the object proposed is to rescue souls from hell.” There is great danger, according to the Finneyites, to “clog the chariot wheels of salvation” by brining into disrepute the measures that God is using to save souls. This indeed sounds like an honorable and noble thing, and nobody wants to hinder the work of God. But if in fact the New Measures are by no means the power of God unto salvation, but sheer emotionalism, and feeling, then it is an even greater danger to regard it as the power of God unto salvation, when in fact neither God not salvation accompany the Anxious Bench and the New Measures. Meanwhile the disastrous consequences of false excitement, in the name of religion, are entirely overlooked. No account is made comparatively, of the danger of bringing both the truth and power of God into discredit, by countenancing pretensions to the name of a revival where the thing itself is not present. The danger itself is by no means imaginary. Spurious excitements are natural and common. Gross irregularity and extravagance, carried often to the point of downright profanity, are actually at work, in connection with such excitements, on all sides. The whole interest of revivals is endangered, by the assumption impudently put forward, that these revolting excesses belong to the system. False and ruinous views of religion, are widely disseminated. Thousands of souls are deceived into a false hope. Vast obstructions are thrown in the way of true godliness. But of all this, no account is made by those who are so sensitively jealous of danger oh the other side. The only alternative they seem to see, is Action or No action. But the difference between right action and wrong action, one would think, is full as important, to say the least, as the difference between action and no action. In other words, Nevin, who was in fact a supporter of true revivals, thought that true revivals, when God chooses to bring them about, would be brought into discredit by the advocates of the New Measures, because they have been calling everything in which people get excited and aroused, a “revival.” Therefore when all that is present in these so-called “revivals” is emotionalism, and God is not really actually present doing a work, and than as a result, “false and ruinous views of religion are disseminated” and thousands of souls are deceived into a false hope, believing that it was God, when in fact, all they got was emotionalism, it can be rightly understood why Nevin should have written such a tract, and rightly called into question the system of the Anxious Bench. In what could be described as something close to a prophetic utterance, Nevin saw the logical and inevitable outcome of those Church that had whole-heartedly adopted the New Measures. The bearing of it [an inquiry into the merits of the Anxious Bench] upon the interests of religion in the German Churches, is of fundamental and vital importance. A crisis has evidently been reached in the history of these Churches; and one of the most serious points involved in it, is precisely this question of New Measures. Let this system prevail and rule with permanent sway, and the result of the religious movement which is now in progress, will be something widely different from what it would have been under other auspices. The old regular organizations, if they continue to exist at all, will not be the same Churches. Their entire complexion and history, in time to come, will be shaped by the course of things with regard to this point. Lutheran Church in America (ELCA) has just recently made provision for homosexual ministers to be ordained. The Lutheran Church (Missouri Synod) is still orthodox, but even to this day, the New Measures are being applied in some way, shape, or form in these Churches, and systematically the Bible is being watered down. Nevin was indeed correct that as a result of the unharnessed reign of the New Measures and the Anxious Bench, these Church have become something completely different than what they were originally. John Williamson Nevin, “The Anxious Bench” edited by Charles Yrigoyon Jr., and George H. Bricker, in Catholic and Reformed: Selected Theological Writings of John Williamson Nevin (Eugene, OR: Pickwick, 1978), 17. John Williamson Nevin, “The Anxious Bench”, 22. I understand “the thing itself” to be referring to the “truth and power of God” in revival.